In keeping with their commitment to the environment and sustainable surfing, the Maavahi produces its own freshwater on board daily – enough to provide up to 250 litres of fresh water per person per day! 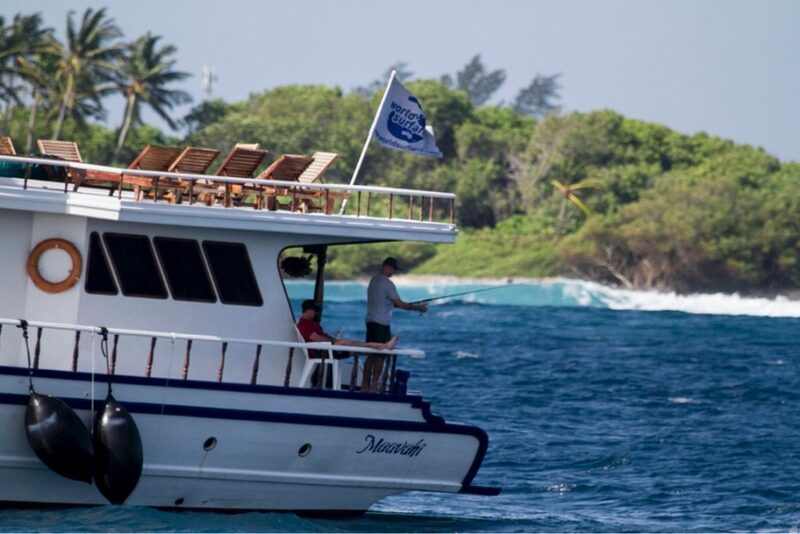 From March – October, the Maavahi will be deployed for 10 Night Outer Atoll Trips. Huvadhoo and Addu Atolls (referred often as the Southern/Outer Atolls) are located in the most southern section of the Maldives. Although not completely uncrowded, there are significantly fewer surf charters and surf resorts operating in this area, so even the most popular spots in this region tend to be relatively uncrowded. Of all the Maldives surf spots, the breaks in the Outer Atolls remain among the most secluded and idyllic, preserving the reality of a remote island paradise that comes complete with incredible waves. 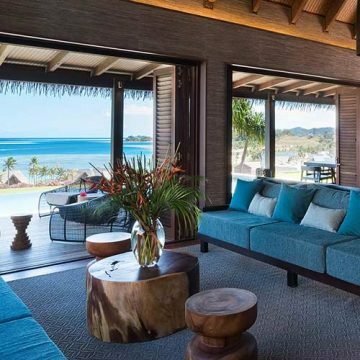 Onboard Maavahi, there are 6 spacious guest cabins. 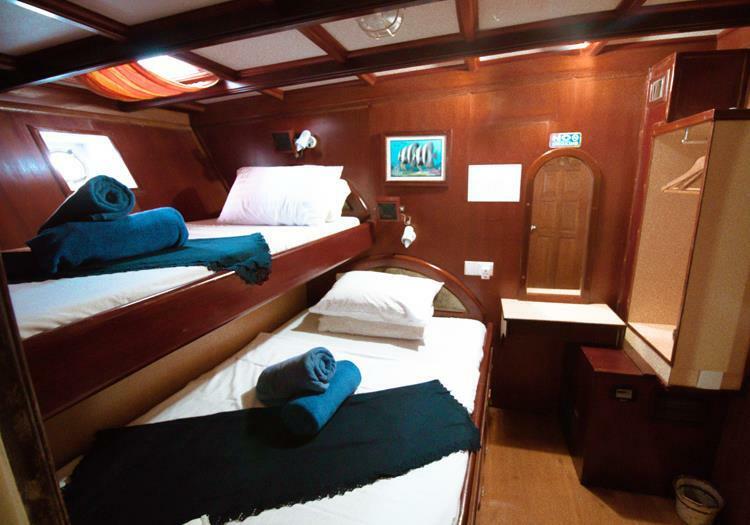 All 6 cabins have twin bunk beds (1 below and 1 above). 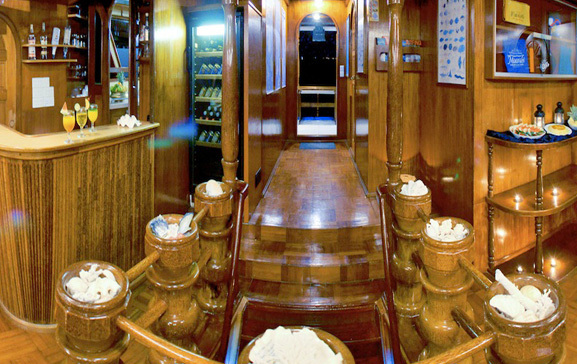 All the cabins are located on the lower deck, with the surf guide’s cabin being on the main deck. All cabins have air-conditioning, ensuite bathroom and hot and cold showers. There is also a small wardrobe for storage and a wall fan if you don’t like air conditioning. After surfing up to 4 times a day, you do get a little hungry! Your experienced chef will cook up a storm – 3 times a day, every day, with a mixture of delicious cuisines and not just curries! Snacks are also available at any time. 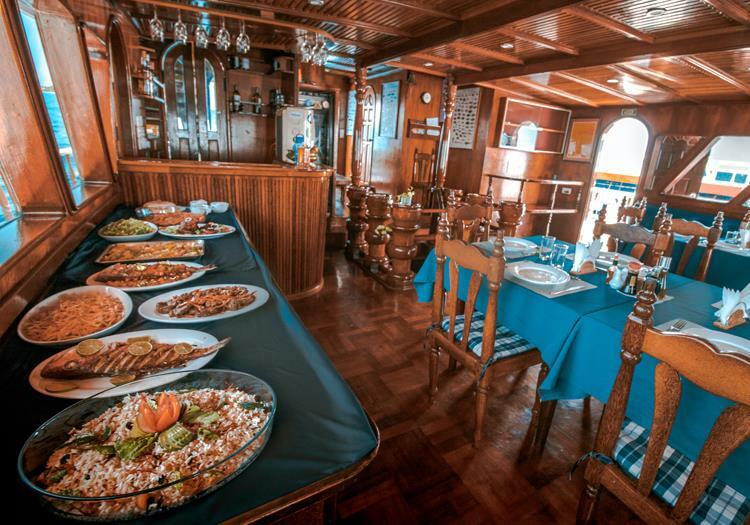 Dine in the spacious indoor dining room or perch yourself on one of the two upper decks and enjoy the breathtaking views of the various islands scattered throughout the Maldives. 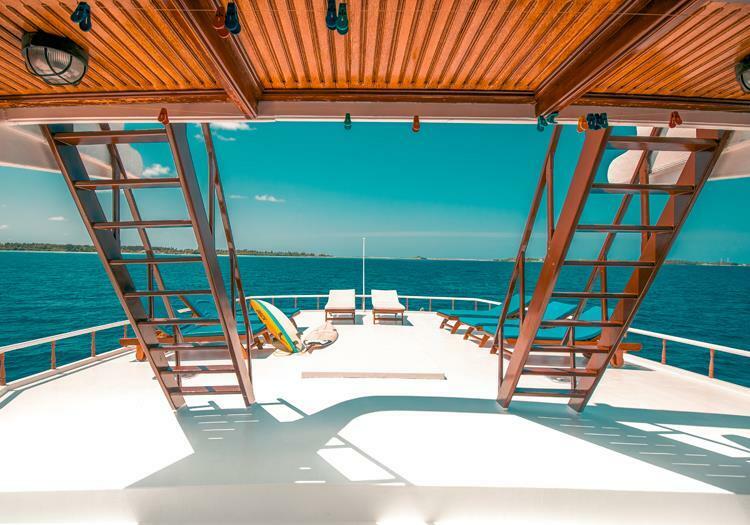 Onboard Maavahi Surf Charter, you’ll find a range of activities to keep you entertained between surfs or on the occasional lay day. Night/Day fishing – troll a lure and catch dinner. The Maldives is a renowned fishing spot with the abundant marine life feeding on the generous offerings of the reef. Tuna, mackerel, barracuda and many more varieties. Who knows – you may even have to pit your strength against a sail-fish and reel in a beast. Snorkelling – The Maldivian reef teems with a stunning array of fish species and coral. Cyrstal clear water with great visibility rated as one of the top 10 dive sites in the world. Even from the shallower world of snorkelling you can see the beauty of the reef. Visit a local village – Cruising through the Maldives on a surf charter gives you the chance to experience a unique culture and understanding of the village lifestyle by visiting one of the many local villages. Or if you’re too surfed out to do anything else, just kick back and relax onboard the super comfortable, Maavahi cruise boat. Kaededhdhoo (Right) – Island with the airport on it. Has a right-hander that is fun when the swell is large. It’s on the west side of the atoll, so it doesn’t receive as much swell as the other breaks. Beacons or Barracuda Point (Right) – One of the most powerful and hollowest waves in the Maldives. Faces south so it picks up plenty of swell. Needs north-west or north winds, so is always better early season February to April. Pretty short ride with easy takeoff, after which you then line up for the inside section and the fun begins. Best on mid to high tide and can be surfed 2 to 10 feet. Dhigulaabadhoo (Left) – Across the channel from Beacons, we call it Dhiraagu after the phone company in the Maldives, as the island is shaped like a phone. A sort of fat ride on the takeoff but if the swell direction is right, it can link up with another section on the inside, where it produces a bit more speed and power. Needs the same wind as Beacons and can be surfed on all tides. Plenty of marine life around here and possible to see whale sharks. Castaways (Right) – Very shallow – only to be surfed on high tide. When the swell is over 4 foot, it breaks out the back where a fun wave can be had and you make the choice to keep going through to the inside, where it hits the shallow ledge and gets a bit tricky. Nice little, deserted island in front of the break. Blue Bowls (Right) – Long wave, not so hollow but a lot of fun. Best around 4-6 feet on mid tide. It is protected if the wind swings around to south/south-west which is common from April – August. Gani Point (Right) – Another wave protected from south/south-west winds. Gets very hollow especially on mid tide. Booga Reef (Peak) – A bombie in the middle of the channel between 2 islands. Not so hollow but a fun ride can be had. The right is usually the pick, needs west / north-west wind, making it another protected option from April – August. Love Charms (Left) – Great wave from takeoff to finish, nice tube on the inside, breaks 2-10 feet, needs west to northern winds and can be surfed on all tides. Fall in love with it. Rockets (Left) – Fun wave, not so hollow but nice long walls to be had. Picks up plenty of swell and can be surfed all tides. Needs west to north winds.